Target has had some awesome collaborations throughout the years, but this has been one of my favorites to date. I really like the broad selection of items in this collection from skirts to trench coats! I also really dig the fact that he included the guys, very few if any designers have done that. I actually spent my Sunday Target hopping looking for the key pieces that I just had to have! When I saw the pieces I have to admit that I was a little blown away by the look and quality of the items. They felt rich and were very well tailored. I also found that the clothes ran true to size. I actually gasped when I saw and felt the animal print sweater--oh my! The print was gorgeous and the fabric felt so luxurious. I think it's important to note that the sleeves are a soft silk material, which gives great contrast to the rest of the sweater. Then I knew that I had to have the matching skirt to go with the sweater naturally. The skirt was also very well made and the fit was very flattering. Next, I moved on to the Boom sweater that Jessica Alba has been seen sporting all over town. And you know if it's good enough for Jessica....besides it looks ultra cool. I also really liked the modern shirt dress in the collection with yet another great print, but unfortunately it was sold out at the store. I am hoping some girl has nowhere to wear it to and returns it! My only disappointment from this collection was that there weren't enough purses to go around! I mean apparently I would have had to be at my neighborhood Target by 7 am to make the line to maybe get one bag. So I am now stalking them on EBAY. Tell me were you able to get a bag? If so, which one, and are they worth the EBAY splurge? Did you score any other items? Do tell. I agree that this collaboration was good! I featured some fitting room photos in my Phillip Lim for Target review on The Key To Chic, and I shared my favorites. I shopped both online and in store to make sure I got my wish list pieces. 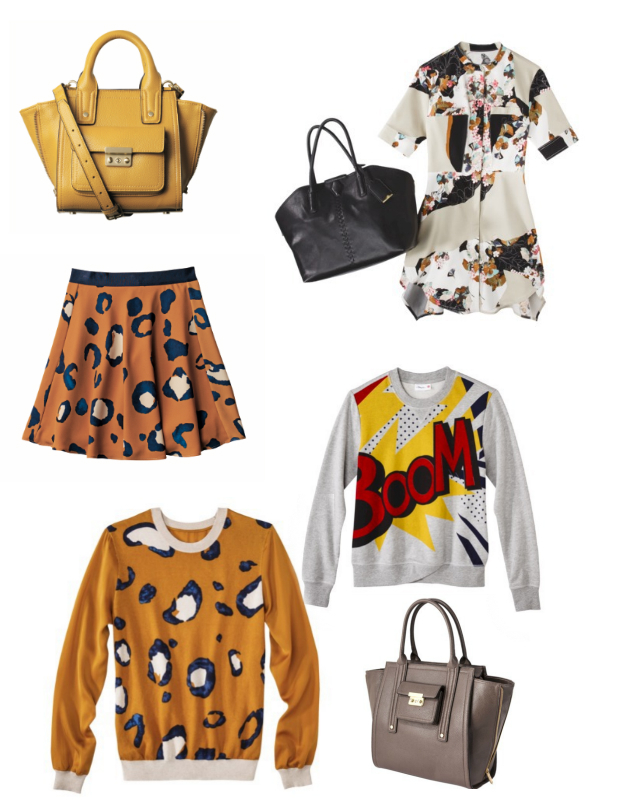 I am in love with the animal print pieces and the mini satchels the most! There were so many bags to choose from, it was hard narrowing it down!